18th December 1916: The longest and one of the most costliest battles of World War One, the Battle of Verdun, ended in stalemate. The French counter-attacks in the latter months recaptured much of the lost land including the forts at Douaumont and Vaux Forts with an estimated total of 360,000 French casualties and 340,000 German casualties since February. For both sides the battle turned more into one of prestige than strategic importance, and for the French Verdun symbolises the horror and the suffering of the nation during the war. 13th December 1916: General Joffre is replaced by General Robert Nivelle as commander in chief of the French forces. Nivelle had himself launched successful counter-attacks at Verdun, re-taking most of the important positions still in German hands, and capturing 11,000 prisoners. 12th December 1916: In response to a letter from US President Woodrow Wilson to all the war parties, in a speech in the Reichstag German Chancellor Bethmann-Hollweg offerred to open peace negotiations, but it is widely rejected by the Allies, including a majority of the soldiers and population. At the same time, realising that a military victory on the Western Front was now highly unlikely, Germany was preparing for its next strategy to knock Britain out of the war through the use of unrestricted submarine warfare. 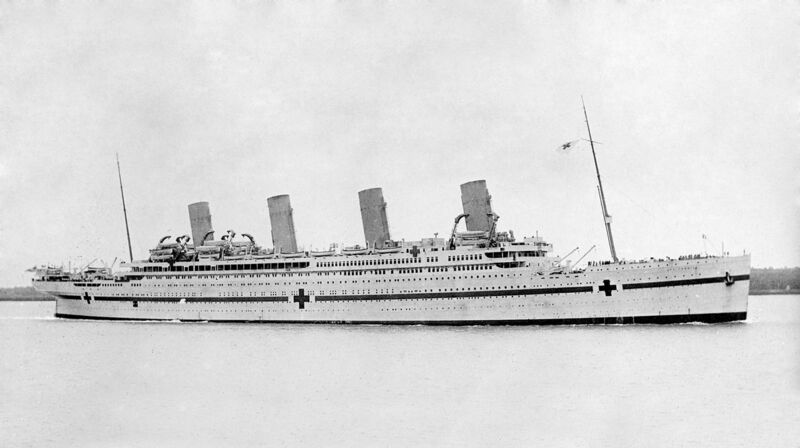 21st November 1916: The Hospital Ship HMHS Britannic, sister ship of the Titanic, hit an underwater mine laid by a German submarine and sunk off the Greek island of Kea. Of the 1,065 crew and medical staff on board 1,035 survived. Following the sinking of the Titanic in 1912 modifications were made to her design, and she too was thought to be unsinkable. The ‘Britannic’ was the largest ship to be sunk during the First World War. 18th November 1916: With winter setting in and the muddied and crater-filled battlefield now practically impassable, on the 18th November 1916 and after 141 days the Battle of the Somme ended. During this time the Allies had advanced only 8kms (five miles) but at a massive loss to both sides. The British suffered around 420,000 casualties, the French 195,000 and the Germans around 650,000 (photograph below of the Thiepval Memorial to the 72,246 British missing of the Somme). The first day of the Somme, 1st July 1916, remains the most deadliest in British military history, and BEF Commander Field Marshal Haig and 4th Army Commander General Rawlinson have been criticised ever since for the human cost of the battle and for failing to achieve their territorial objectives. Only in the sense of relieving the French at Verdun can the British have claimed any measure of success. However the battle did take a toll on the Germans and their losses meant that they could no longer countenance an offensive strategy on the Western Front until the Spring of 1918. General Falkenhayn was sacked and replaced by General Erich Ludendorff at the end of August 1916, and at a conference at Cambrai on 5th September, a decision was taken to build a new defensive line – the Hindenburg Line – well behind the Somme front to which the Germans, conscious of a dangerous lack of men and resources should a new Spring attack come in the new year, retreated to in February 1917. For the Australian Imperial Force the two tours of the Somme were extremely hard and memorable for different reasons. The taking of Pozieres, plus the diversionary attack at Fromelles, in July and August 1916 came at a high cost and resulted in more Australian casualties in these six weeks than the entire Gallipoli campaign. When the four divisions of I Anzac Corps returned to the Somme around Flers in late October 1916 their fight was as much against the elements as the German Army in what the official historian Charles Bean described as ‘the most trying period ever experienced by the AIF on any front’. Between the 1st July and 30th November 1916 the AIF had a total of 38,408 casualties of which 11,410 were killed in action or died of wounds, 26,047 wounded and 951 taken prisoner. 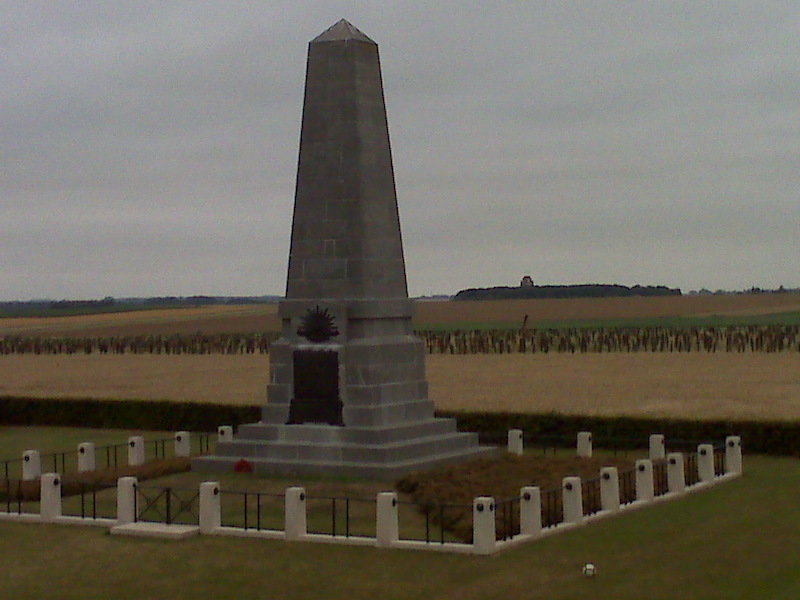 Of the four AIF Divisions the 2nd suffered the most with 11,673 casualties, including 244 that were killed in action or died of wounds from the 22nd Battalion (photograph left of the AIF 1st Division memorial, Pozieres, with the Thiepval Memorial visible on the horizon). Although the offensive had officially finished, the AIF remained in this sector enduring the Somme mud and biting cold for the duration of the 1916-17 winter. 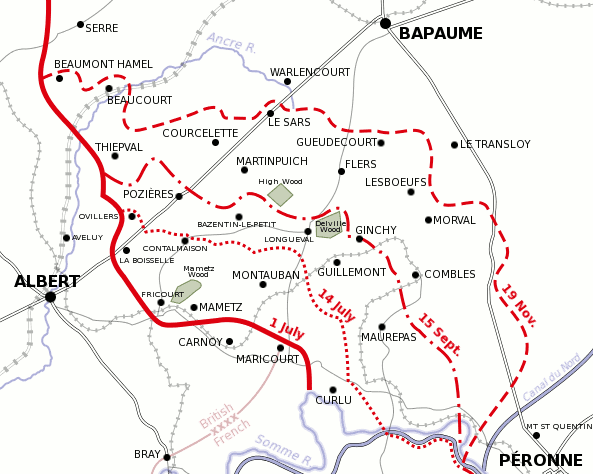 15th September 1916: The Battle of Flers–Courcelette was the third and final general offensive mounted by the British Army on the Somme in 1916, which attacked an intermediate line and the German third line to take Morval, Lesboeufs, and Gueudecourt, which was combined with a French attack on Frégicourt and Rancourt to encircle Combles and a supporting attack on the south bank of the Somme. The strategic objective of a breakthrough was not achieved but the tactical gains were considerable, the front line being advanced by over 2,500–3,500 yards (2,300–3,200 m) and many German casualties being inflicted. The battle was the début of the Canadian Corps, New Zealand Division and tanks of the Heavy Branch of the Machine Gun Corps on the Somme. 19th July 1916: The Battle of Fromelles. The attack, designed to exploit weaknesses in the German defences supporting the Somme defence to the south, was the début of the Australian Imperial Force on the Western Front and is described as “the worst 24 hours in Australia’s entire history”. Of 7,080 BEF casualties, 5,533 losses were incurred by the 5th Australian Division; German losses were 1,600–2,000, with 150 taken prisoner. 14th July 1916: Two weeks after the opening of the Somme offensive, the British Fourth Army launched their second major attack against the German second defensive position from the Somme river past Guillemont and Ginchy, north-west along the crest of the ridge to Pozières on the Albert–Bapaume road. The objectives of the attack were the villages of Bazentin le Petit, Bazentin le Grand and Longueval which was adjacent to Delville Wood, with High Wood on the ridge beyond. Tactics were much changed from the attack on 1st July. The attack was made by four divisions on a narrower front of 6,000 yards (5.5 km) at 3:25 a.m. after a short five-minute hurricane artillery bombardment. Field artillery fired a creeping barrage and the attacking waves pushed up close behind it in no man’s land, leaving them only a short distance to cross when the barrage lifted from the German front trench. Most of the objective was captured and the German defence south of the Albert–Bapaume road put under great strain but the attack was not followed up due to British communication failures, casualties and disorganisation. Subsequent and further costly attacks would take place over the next two months towards High Wood, Delville Wood, Pozieres, Guillemont and Ginchy. 1st July 1916: The first day of the Battle of the Somme, 1st July 1916, remains the darkest day in British military history with 57,470 casualties of which 19,240 were killed. The Somme would also become infamous for the debut of the New Army created by Lord Kitchener‘s call for recruits at the start of the war, with many of the men fighting alongside workmates or neighbours from towns in what would be known as the ‘Pals’ battalions. As a result the high death toll amongst these battalions had a devastating impact on many towns and communities, particularly in the north of England, and Newfoundland. Originally intended as a combined Franco-British operation on both sides of the Somme river, the French reduced their participation to a supporting role in the operation as a result of the large-scale German attack on their Verdun front from February 1916. The intentions of the British Commander-in-Chief, General Sir Douglas Haig was to burst right through the German defences, sending his cavalry on to Bapaume, and rolling up the entire German position on the Western Front. The prelude for the Somme offensive commenced on 24th June with the start of what was originally a five then extended to seven day bombardment of the German wire, trenches, strongholds and artillery by what would be the most intense artillery bombardment seen on the battlefront to this point. Despite varied reports from raiding parties of the state of the German wire and trenches, confidence was high that little German resistance would be met and orders were given for the attacking battalions to proceed at a walking pace to conserve energy for the long advance ahead. However the defending German army had dug their bunkers deep into the countryside, the artillery was not effective in cutting the wire, and the Germans were prepared for and expecting an attack. Following the detonation of 19 mines (Hawthorn Ridge mine photographed) under the German lines, at 07:30 whistles blew all along the British front line and under a clear blue sky the attacking battalions left their jumping-off trenches where they were met with withering machine gun fire followed by artillery on the men trying to cross no-man’s land, leading to the greatest loss of life in a single day in the British army. The 11 British divisions attacked over a 25 km frontage north of the Somme, with the five French divisions south of the river, and as events unfolded that day and over the coming weeks and months, ground would be gained in the south of the offensive whereas to the north around the Ancre river and the German strongpoints of Thiepval, Beaumont-Hamel and Serre the attack would stall and be abandoned until the latter stages of the 141 day offensive. The Australian Imperial Force would be pressed into action against the key German strong-point of Pozieres on 23rd July where under a tremendous bombardment the AIF 1st, 2nd and 4th Divisions would sustain 23,000 casualties in the six weeks while taking and holding the Pozieres Heights. The four AIF divisions in France would return to the Somme in October in the Flers sector where they would endure the awful mud, wet and cold of the Somme winter. Torrential rains in October turned the Somme battlegrounds into a muddy quagmire and on 18th November the battle ended, with the Allies having advanced only eight kms (five miles) for the cost 0f over 1.2 million casualties on both sides. During this time the British suffered around 420,000 casualties, the French 195,000 and the Germans around 650,000. 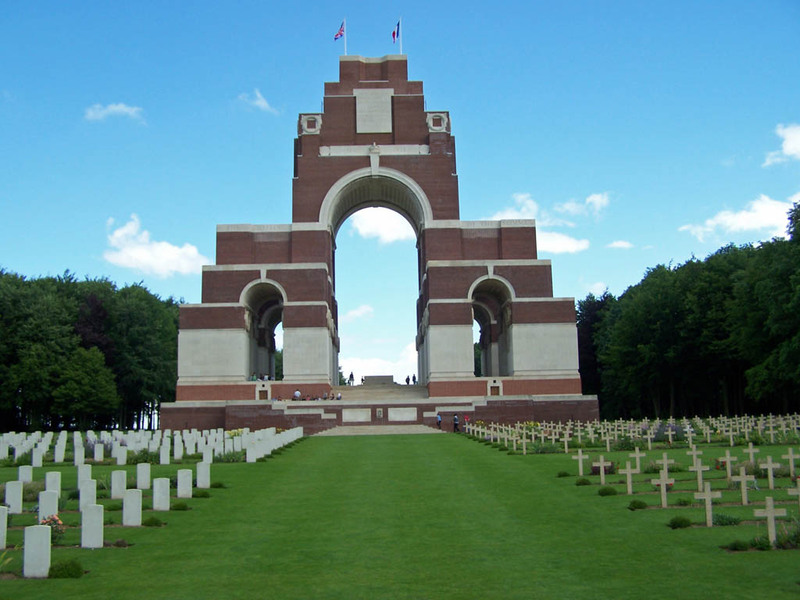 The Thiepval Memorial to the Missing of the Somme (photograph below left) is a war memorial to 72,195 missing British and South African servicemen, who died in the Battles of the Somme of the First World War between 1915 and 1918, with no known grave. The Australian missing are commemorated on the Villers-Bretonneux Australian National Memorial. Success for the British can only be measured in small gains, namely helping relieve the besieged French at Verdun, and for this General Sir Douglas Haig, the commander of the BEF, and General Henry Rawlinson, commander of the Fourth Army, have been criticised ever since, for the human cost of the battle and for failing to achieve their territorial objectives. However the losses and strain placed on the German Army was greater and by early 1917 they had withdrawn to the heavily fortified Hindenburg Line with a new strategy to stand and hold while their U-boat submarine fleet undertook unrestricted warfare against shipping and would try and force the Allies to negotiate for peace. 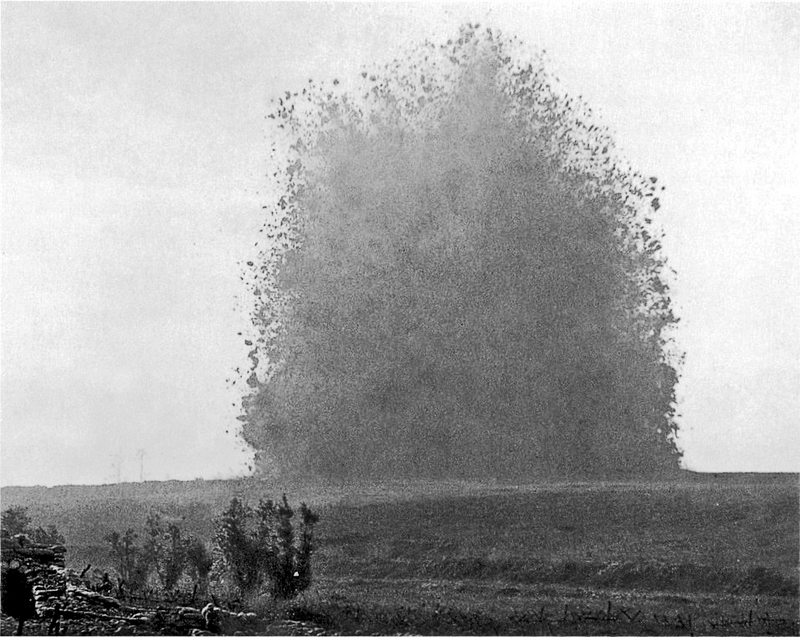 29th June 1916: Bad weather on the Somme made observations about the effectiveness of the bombardment on the German wire unreliable, so the decision was made by British and French commanders to delay the Somme offensive by 48 hours and to continue the bombardment. 26th June 1916: On the Somme, the heavy artillery commenced its bombardment of the German strong-points, trenches, enemy artillery etc while the field artillery continued on wire cutting. 24th June 1916: The British artillery commenced its bombardment of the German lines on the Somme over a 25,000 yard frontage, with a focus in the first two days of cutting the wire. 5th June 1916: Lord Kitchener drowned along with 642 other crewmen and general staff when HMS Hampshire sank to the west of the Orkney Islands after the ship struck a German mine when enroute to Russia. A former British military commander in the Sudan and the Boer War, Lord Kitchener became Secretary of State for War in 1914 and foreseeing a lengthy war organised the creation of what was then the world’s largest volunteer army, of which many of the new recruits went into ‘Pals Battalions’ within Kitchener’s New Army. 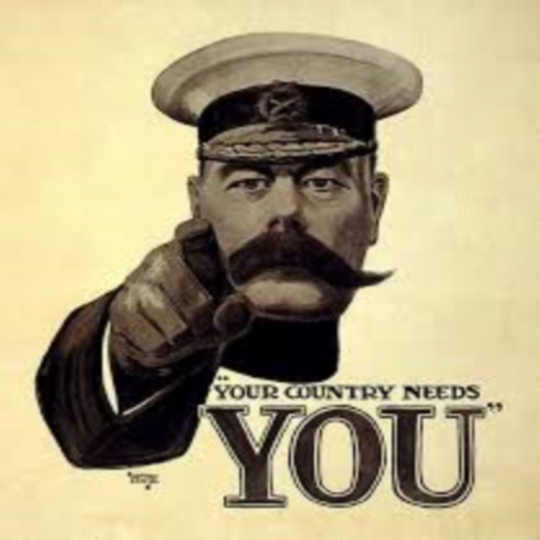 Lord Kitchener’s image was used in the recruiting posters of that time along with the phrase ‘Your country needs you!’, and remains one of the most recognisable images of the First World War today. 31st May 1916: The Battle of Jutland was the one major naval engagement of the First World War between the British and German naval fleets. 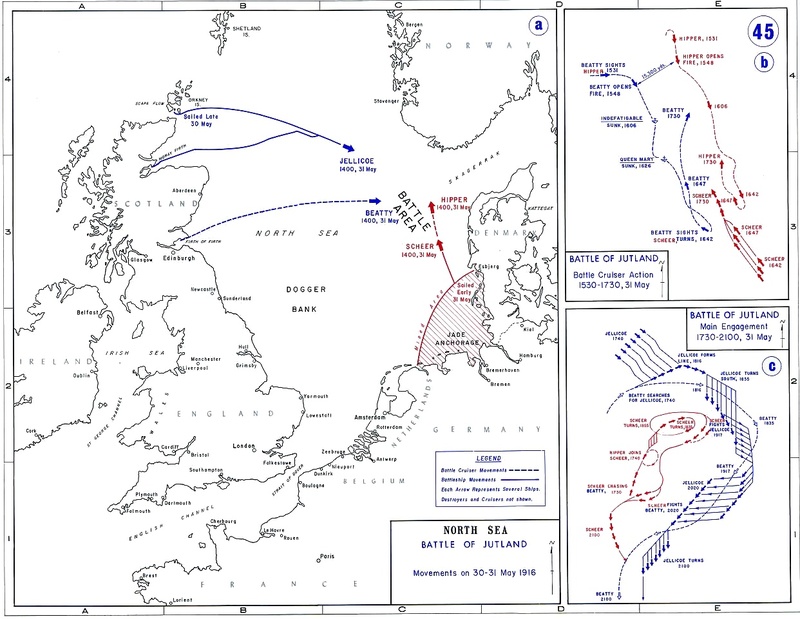 The battle was designed by the German Navy to break the blockade that the British had thus far been applying to their North Sea ports by luring the Royal Navy’s Grand Fleet out and destroying it with a combination of surface ships and their submarines. The two fleets engaged on 31st May 1916 and in the ensuing battle fourteen British and eleven German ships were sunk, with the loss of 6,800 British and 3,000 German sailors. Both sides claimed victory. For the Germans they had inflicted greater losses on the enemy. For the British, the German High Seas Fleet retired back to port and did not pose a significant threat to the Allied shipping and war effort again. However the German war and naval strategy would change in 1917 with the move to unrestricted submarine warfare which was used to devastating effect. 21st February 1916: The Battle of Verdun started with a German offensive against the French positions on the hills to the east of the Meuse. The German plan was that by threatening to capture the city of Verdun and its forts, the French would throw all its strategic reserve in counter-attacks to defend the position and in doing so ‘bleed the French dry of men and resources’. Chief of German General Staff Falkenhayn underestimated the French, for whom victory at all costs was needed to justify the sacrifices already made. The battle of attrition lasted 10 months and with approximately three quarters of a million casualties would become one of the longest and most costly battles in history. 27th January 1916: With not enough volunteers to fill the ranks of the British Army, The Military Services Bill was introduced into Parliament providing for the conscription of single males from the age of 18-41. In May 1916 this was extended to include married men, and in April 1918 the upper age limit was raised to 50. 8th January 1916: On the night of 8th –9th January, 17,000 British soldiers were evacuated from Helles, bringing the three-week evacuation, and the Gallipoli campaign, to a close. In just over a week, 35,000 soldiers, 3,689 horses and mules, 127 guns, 328 vehicles, and 1,600 tons of stores had been taken off Helles. 7th January 1916: In Gallipoli the Turkish forces at Helles launched a major attack on the remaining 19,000 British troops. The attack was preceded by a furious artillery bombardment but many Turkish soldiers, realising that the British were leaving the peninsula, refused to leave their trenches. The attack failed.